Clinton, Michigan - Eden Foods has developed a line of delicious, convenient 'heat and serve' entrees. They are Organic Rice & Beans in a can. Organic Brown Rice & Organic Caribbean Black Beans are Lundberg short grain rice, black turtle beans, organic onion, organic paprika, organic garlic, Eden sea salt, organic cumin, organic cayenne pepper, and organic cinnamon. Organic Brown Rice and Organic Garbanzo Beans are Lundberg short grain rice, garbanzo beans (a.k.a. chick peas), organic onion, organic garlic, Eden sea salt, and organic parsley. Organic Brown Rice and Organic Kidney Beans are Lundberg short grain rice, dark red kidney beans, organic onion, organic garlic, Eden sea salt, and organic parsley. Organic Brown Rice and Organic Green Lentils are Lundberg short grain rice, green lentils, organic onion, organic garlic, Eden sea salt, organic parsley, organic bay leaf, organic cumin, and organic cayenne pepper. Organic Brown Rice and Organic Pinto Beans are Lundberg short grain rice, organic onion, organic garlic, and Eden sea salt. Organic Brown Rice and Organic Small Red Beans - the classic Cajun Red Beans and Rice are Lundberg short grain rice, small red beans, organic tomato puree, organic onion, organic garlic, organic red pepper, Eden sea salt, organic cayenne pepper, organic parsley, organic bay leaf, organic black pepper, and organic cumin. Eden Organic Rice & Beans are low fat, low sodium, and saturated fat free. Each is a good source of magnesium and provides eight to sixteen percent daily value of high quality dietary fiber per serving. Eden Organic Rice & Beans are expertly prepared at Eden's certified organic and kosher, Meridian Foods cannery in Eaton, Indiana. Eden selected organic beans are soaked overnight and blanched, combined with the brown rice, organic seasonings, and a bit of Eden Sea Salt, and cooked to perfection with purified water. Whole grain and beans are Nature's most important nutritional duo. Beans are a valuable source of two essential amino acids not found in cereal grains, lysine and threonine. In turn, whole grains complement beans and together deliver complete protein with all essential amino acids, together with a full spectrum of important antioxidants, vitamins, and minerals. Beans and whole grain provide slowly released energy. This satisfies hunger longer and helps us to lose weight and maintain optimal health. Beans and whole grain may help to prevent heart disease, cancer, and type 2 diabetes. According to scientists at the USDA Human Nutrition Research Center at Tufts University, "Whole grains help regulate blood sugar by slowing down the conversion of complex carbohydrates into sugar. In fact, low-glycemic index foods such as whole grains reduce hunger and can help to control weight." Scientists at the Agriculture Research Service recently completed a study of more than 2,000 people concluding, "at least three or more servings of whole grain foods everyday could reduce the chances of developing metabolic syndrome - a condition marked by a combination of abdominal obesity, high blood pressure, poor blood sugar control, low HDL 'good' cholesterol, and high blood fats." According to the FDA, "Diets rich in whole grain foods and other plant foods and low in total fat, saturated fat, and cholesterol, may reduce the risk of heart disease and some cancers." The 2005 Dietary Guidelines for Americans for the first time emphasize the importance of whole grain and distinguish between whole and refined grain. Eden Rice & Beans are a convenient way to include more whole grain in your diet. Just heat, stir, and serve. Add vegetables for a complete meal, or get creative with your own recipes and seasonings. Eden cooks it all perfectly, so you don't have to. 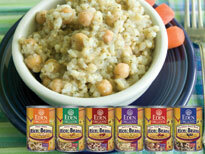 Eden Organic Rice & Beans come in 15 ounce cans, 12 to a case. We suggest a retail price of $1.89. They are kosher, too.